The City of Waupaca is the county seat of Waupaca County. Waupaca has a city manager/mayor/city council form of government. Ten aldermen, two from each district, represent the city’s five voting districts. 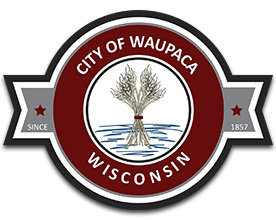 The Waupaca City Council meets on the first and third Tuesday of each month at 6pm. Meetings take place in the Council Chambers in the lower level of Waupaca City Hall. The Council consists of a Mayor and ten Alderpersons, two from each of the five Aldermanic Districts. Each Alderperson represents the interest of his or her District and the city as a whole. At the Organizational Meeting on the third Tuesday in April, the Alderpersons elect a Council President who acts in the absence of the Mayor. The Council . . .
1. Adopts and amends the city ordinances. 2. Determines city policies and standards. 3. Determines how much money shall be spent and for what purpose. 4. Determines what city taxes shall be levied. 5. Approves contracts and agreements.